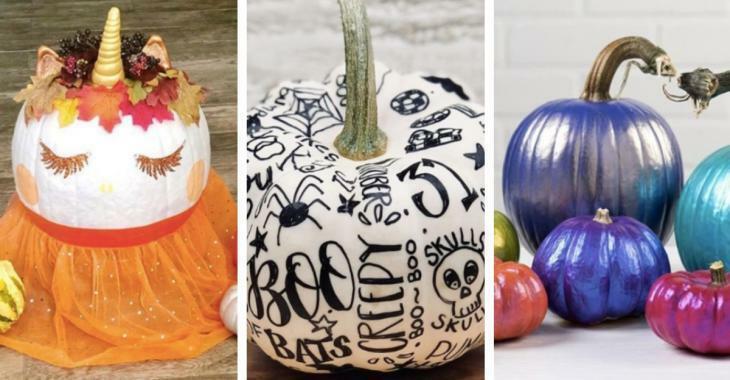 Tips and Tricks : Here are 18 pumpkin painting ideas for all those who hate carving pumpkins! Here are 18 pumpkin painting ideas for all those who hate carving pumpkins! Colorful ideas for a unique change! If you love to paint and hate carving, look no further to find the perfect thing for your Halloween decorations. You will find everything you need right here! We present you 18 beautiful ideas of painted pumpkins, and material that you have never seen before! Colorful and original ideas to finally change the good old Jack'O lanterns with a candle. We switch from the knife to a paint brush! 1) Once the black slate paint is completely dry, you can stick white flowers in the shape of a moon on the pumpkin with a hot glue gun. 2) Same principle to make cacti! Just stick pink flowers on top of the cactus once the green matte paint dries well. 3) If you like to paint flowers, you'll love this idea! 4) These pumpkins painted black, white and gold are reminiscent of the costumes of the king's fools from that era. They are wonderful! You will notice that a glossy polish has been applied for an even more remarkable effect. 5) You can also still make Jack'O lanterns and ghosts, but painted! 6) Original is not it? You like? 7) A painted pumpkin can even be used as a flower pot holder! A great idea for an autumn centerpiece. Choose a color that you like. 8) Even small pumpkins make charming decorations once they are painted. 9) Painted white with colored construction paper, you can make a beautiful unicorn! 10) You can even make an autumn unicorn with artificial leaves. 11) A Sharpie permanent marker will allow you to draw on a pumpkin painted in white. NOTE: Scroll through the photos from left to right to see them all. 12) Add color to your decor! 13) Make beautiful decorations on your pumpkins. 14) Use metallic spray paint! 15) Or you can paint patterns that you like!? 16) Create fun themes for your Halloween party! Do not hesitate to use black glitter! 17) Play with colors and patterns! Polka dots, straight lines, curves or plaid patterns! 18) And finally, use the gradations to decorate!